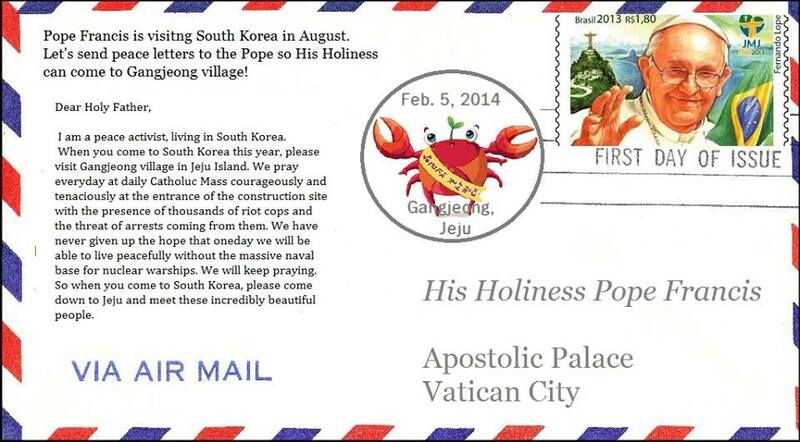 The people in Gangjeong are having an urgent and important campaign to send letters to Pope Francis, appealing him to please visit Gangjeong. Please refer to the below and send yours to Pope Francis. Please visit Pope to Jeju site here, too. Let’s write peace letters to Pope Francis so that His Holiness can visit Gangjeong village on his trip to South Korea in August! Yes, Pope is coming to Korea this August. The details of his trip or itinerary is not decided yet, but we think that the Vatican will soon decide detailed schedule. So it is very important for us to write and send letters to Pope Francis NOW to help Him know more about Gangjeong’s 8 years of peace movement against massive naval base for nuclear… warships, and convince Him to visit the suffering village on the island of world peace. Here’s a letter that I sent to Pope a week ago, and I am writing again and again until he replies! I am a peace activist, living in South Korea. I hope this letter finds you well. I have a big, but a simple wish for Your Holiness. And I am praying God hear me and make it come true. When you come to South Korea this year, please visit Gangjeong village in Jeju Island. 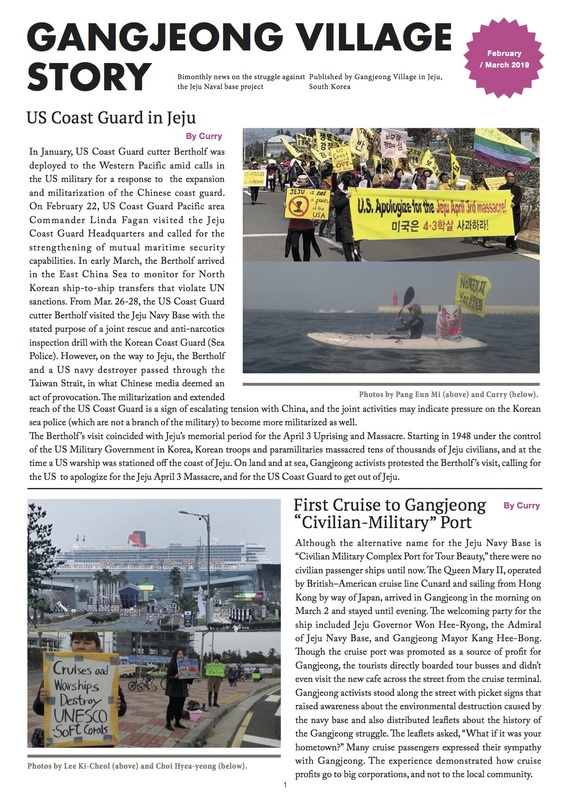 Even though Gangjeong is a small village, but peace-loving people have been resisting against the construction of a massive naval base for 8 years. The naval base construction project has been tearing apart peace of the residents here. The people used to live peacefully before the military project started. We desperately want the peace back. As Bishop Peter Kang U-il said once, peace around the whole country begins here. We pray everyday courageously and tenaciously at the entrance of the construction site with the presence of thousands of riot cops and the threat of arrests coming from them. We have never given up the hope that one day we will be able to live peacefully without the massive naval base for nuclear warships. We will keep praying. So when you come to South Korea, please come down to Jeju and meet these incredibly beautiful people. The Jeju Island was declared the island of world peace in 2005, and yet peace here is under severe danger. We just want to love unconditionally without arms and weapons. I continue to be amazed at the influence The Ghosts of Jeju is having around the world. Today, I received a request on behalf of the people of Gangjeong Village to send a copy of the film to Pope Francis, hoping that he will visit Gangjeong Village on his planned trip to South Korea in August. It seems that the peace activists in Gangjeong have engaged in a letter writing campaign directly to Pope Francis inviting him to Gangjeong.Here is my letter to Pope Francis that will accompany a copy of the film. I would also encourage you to write to Pope Francis.